← He came to the fork in the road . . . and took it. RIP, Yogi Berra. Saw this mini-library box on my way to work and had to get a picture. Don’t you love the shushing librarian, “Miss Kris,” at her desk safeguarding the “stacks”? Very imaginative! 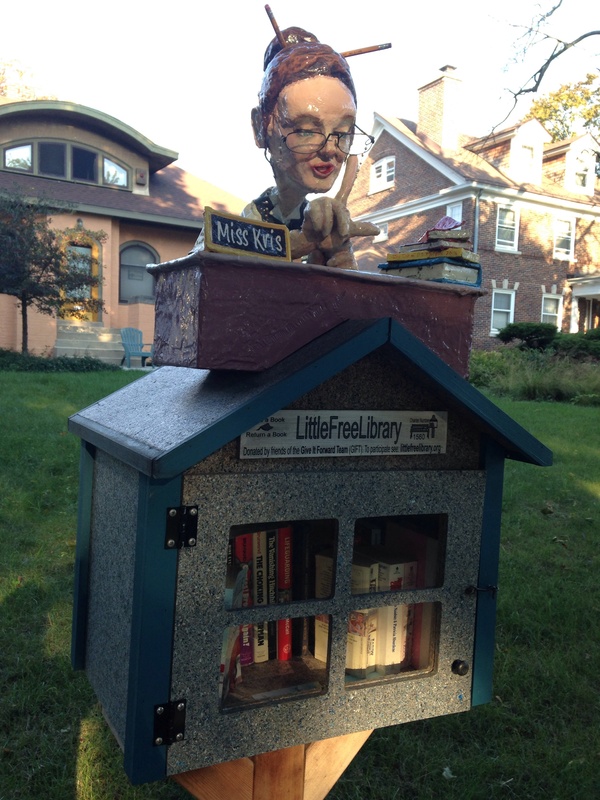 This entry was posted in architecture, Books and reading, Little Free Library, Milwaukee and tagged book box, book sharing, books, librarian, Little Free Library, Milwaukee, Mini-library, reading. Bookmark the permalink. I love it! Thanks for posting these neat examples of LFLs. They are so cool, and I love how much effort people are putting into their boxes. They aren’t merely functional; they’re fun! I love those little boxes! !